Jacob snuck down the stairs, looking back over his shoulder to be sure his parents weren’t following, and stopped at the bottom to peek around the door to the chimney. Santa wasn’t here yet, but Jacob knew it wouldn't be long now. Since putting those worms in Suzie Jo Martin’s hair had made everyone so angry, he was sure his name was on the naughty list. He knew Santa wouldn’t be able to resist the milk and cookies, so Jacob had left a note to ensure the shiny red bike would finally be his. There was no poison in the milk, of course, but Santa wouldn’t know that. 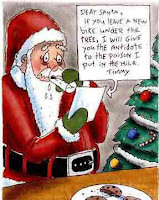 Oh, I'm sure Santa will fall for this! Great story and a lively character. How cute! I love this! A very unique way of using the word!